East Hampshire Council recently commissioned TRA to deliver an in-house session on the principles of urban design for their elected Members. In order to assist Councillors with their important planning role, the workshop involved a series of short seminars on basic design concepts, plenty of opportunity for discussions about the principles of good urban design as well as a local site visit. The 2017-18 Training Workshop Programme for Scotland sees the final 2 workshops taking place at the Novotel Hotel in Glasgow on 6 February 2018. There is still time to reserve your place on these events which will be covering 'The Use and Abuse of Planning Conditions and Section 75 Obligations' and 'Permitted Development and dealing with Prior Approval Notifications'. Here is our pick of the current vacancies on our Planning Jobs Board - with closing dates in December and January. TRA recently delivered the second of two in-house workshops commissioned by Buckinghamshire County Council. The latest session provided An Introduction to Appeals and followed a successful session on Environmental Impact Assessment delivered at the end of September. The latest Neighbourhood Plan to be submitted to TRA for Independent Examination is the Caddington & Slip End Neighbourhood Plan. The plan was submitted at the end of November by Central Bedfordshire Council and Terry Kemmann-Lane has been appointed as the Examiner. We'd like to wish all our Associates, Presenters, clients and contacts a very Merry Christmas and a Happy New Year. We look forward to working with you all again in 2018. 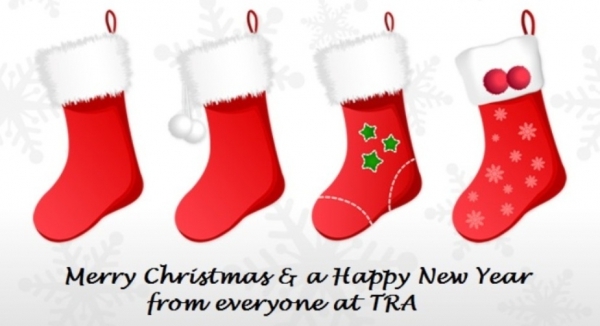 Please note that the TRA office will close on Thursday 21 December and re-open on Tuesday 2 January.